Our painting display was always a feature of Western Days at Guildford Mall. We donated a painting to be raffled each year. There would be a big pancake breakfast, and then the Cloverdale Parade to participate in. They had picked girls to be the Queen and princesses and they were in attendance at the pancake breakfast. One year we took Linda Rivers (Audrey’s daughter) and her cousin, Evie Joseph – both were Percy’s nieces! – with us, in costume. They stole the show. The Queen and her princesses were not too happy. Linda looked like Sophia Loren, and Evie was quite beautiful, as well. They went in the parade with us … they walked with Mickey, while I rode a beautiful black horse, despite wearing a dress! We were part of the Guildford contingent that included Al Principe, the manager of Woodward’s, and a couple of other VIP’s, so it was fun! Lots of comments about our costumes. We participated in the parade two or three years. The manager of the mall said that we were good for the mall, so we got very special treatment. We worked with security for the mall as well as Woodward’s security, without any of the teenagers knowing anything about that connection. I just remembered that I rode in another parade in Langley one time, too. I forget whose horse I had, but Harry Reifle supplied the saddle. [I’m only going to be posting Monday, Wednesday and Friday this week. Love that picture of you Norma on that beautiful black horse!I can see how those girls Linda & Evie could have stolen the show as native girls have such beautiful high cheek bones and gorgeous skin tones.Where we live in northern Ontario we have many Ojibway natives in the area and many of the girls are knock dead gorgeous! You really did so much for your community and it sounds like you were having fun while doing so. P.S. I have left over bars & squares left over from the holidays that I will bring to tea on Wednesday. 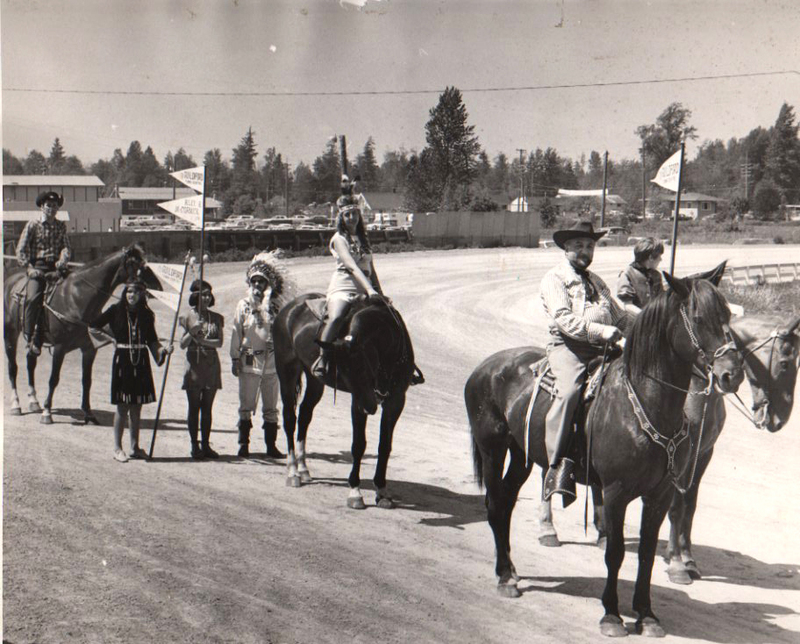 I wonder if those ‘Western Days’ were a precursor to today’s long running Cloverdale Rodeo and its parade. It sounds like you had a lot of fun with your friends. I’m afraid my horse riding experience is pretty limited, although I use to walk in the P.N.E. parade in my very young baton twirling majorette years. Hi Dianne, thanks for the great comments… looking forward to seeing you on Wednesday. Don’t bring too many treats for tea as I think we all overindulged over the holidays. Thanks for the comment, Heather. Will be seeing you for real tea tonight. Looking forward to it. Have goodies left from High tea this afternoon, so you don’t need to bring any. The rodeo parade in Cloverdale was fun. Guildford rented the horses for us, and supplied transportation to get us there and back. Along with the pancake breakfast first, it was fun. We didn’r make any money that day as we didn’t even put he paintings out. It was well worth it to have a day off just to have fun! See you on Thursday!